United Airlines Flight 811, a Boeing 747-122, N4713U, took off from Honolulu (HNL), Hawaii at 01:33 local time, bound for Sydney, Australia, with an intermediate stop at Auckland, New Zealand. The initial climb passed through an area of thunderstorms, so the captain elected to keep the seat belt sign on. As the aircraft was climbing, between 22,000 and 23,000 feet, explosive decompression was experienced. An emergency was declared at approximately 02:20 HST. The captain initiated a 180-degree left turn to avoid a thunderstorm and proceeded toward HNL. The forward lower lobe cargo door had opened in flight, taking with it a large portion of the forward right side of the cabin fuselage. The starboard side engines (no.3 and 4) were damaged and had to be shut down. Parts of the leading and trailing edge flaps where also damaged resulting in the crew electing to use only 10-degrees trailing edge flaps for landing (a non-normal configuration). This resulted in the aircraft having to land at a higher speed than it would under normal conditions. The aircraft was cleared to land at HNL runway 8L. At 02:34 HST, Honolulu tower was notified by the flight crew that the airplane was stopped and an emergency evacuation had commenced on the runway. During the decompression, nine passengers had been ejected from the airplane and lost at sea. PROBABLE CAUSE: "The sudden opening of the forward lower lobe cargo door in flight and the subsequent explosive decompression. The door opening was attributed to a faulty switch or wiring in the door control system which permitted electrical actuation of the door latches toward the unlatched position after initial door closure and before takeoff. Contributing to the cause of the accident was a deficiency in the design of the cargo door locking mechanisms, which made them susceptible to deformation, allowing the door to become unlatched after being properly latched and locked. 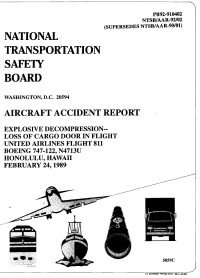 Also contributing to the accident was a lack of timely corrective actions by Boeing and the FAA following a 1987 cargo door opening incident on a Pan Am B-747."